The Best Wooden Rocking Chairs are Designed and Built With Great Care to Fit You Wonderfully. Here's How to Get Yours! My custom wooden rocking chairs, (The Bonn Zero-G series) offers you a number of remarkable benefits that you won't find in other custom rockers. These great features, as well as ordering and contact information, are listed below. My unique rocking chair design is the result of years of intense research and prototype building. The main goal is to give you the best-looking, most comfortable, and most enjoyable rocking possible. There is no other like it, period! The bold, elegant and flexible spine, along with the horizontal slat arrangement, mimics the curvature of your back better than other designs. This translates into beautiful, long-term comfort for you. Each seat is deeply sculpted and expertly shaped with a variety of hand tools. This seat conforms to your seat beautifully! The accent strips within the seat, slat rails and runners add a visual treat for you to enjoy year after year. The unique three-point seat attachment system is very strong and durable. It concentrates sitting forces directly over the back legs, right where they should be. This design strengthens the seat and adds a sense of stability. The arm rests are shaped and smoothed with so much care and attention to detail that they will bring a smile to your face every time you use them. Overall, the Bonn Zero-G series custom wooden rocking chairs say to you, "Come sit, enjoy and relax! Your ship has come in!" 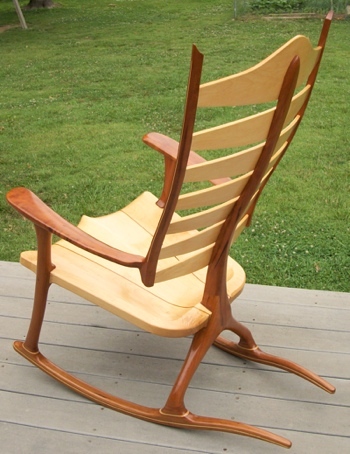 If you are interested in ordering replacement runners for an existing rocking chair, click on this Runners for Sale link and I will guide you through the process. I want to hear from you! Feel free to call, e-mail or write. 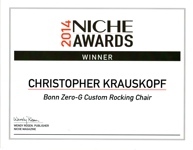 There are currently 3 Bonn Zero-G custom rocking chair styles from which to choose. the Senior Edition (SE) Built more upright for easier entry and exit. Each chair is then customized to fit you. The standard rocker price includes 2 accent strips in the seat, 1 on each slat rail, 1 on each laminated runner, and 1 at the base of each leg. It also includes your choice of domestic North American hardwood. We will discuss these additions in detail before ordering one of the wooden rocking chairs. I accept personal checks, bank checks, money orders and cash. 50% of the quoted price is required at the start of your project, and the remainder (plus applicable shipping and taxes) is required prior to shipping your completed custom rocking chair. When you contact me to place an order, I will let you know a likely starting date and request a non-refundable holding deposit of $150.00. (This secures your place on the building time-line.) When the time arrives to begin building your project, I require the 50% deposit minus the $150.00 holding deposit in order to begin. Custom wooden rocking chairs usually take 5 to 7 weeks to complete. I will keep you informed on the progress of your chair. When it is completed, the final payment (plus applicable taxes and shipping charges) must be paid prior to delivery. Shipping generally runs around $400.00 to $500.00. If you live within 100 miles of Louisville, KY, I can deliver your rocker at no charge. If you live outside that 100 mile radius, we can meet at a location of your choice within the radius. This option is also free of charge. A sales tax of 6% of the rocker's price is required if it is shipped or delivered to an address within the border of Kentucky, USA. This will be added to the final bill. The best way to order one of these extraordinary wooden rocking chairs is to fill out the measurement form located on the Fitting Process page. Here, you will find a great deal of information about how I customize your rocker to be sure of the best fit. It would also be a good idea to contact me during the measurement process so I can help clarify things for you. I am very confident that you will love your custom rocking chair! If it breaks due to faulty construction or materials during normal usage, send it back to me and I will fix it or replace it free of charge. It's that simple. If the chair becomes damaged in some other fashion, I also do repairs. Contact me for more information about this.